Narrative: On April 6, 2011, 24 Tacoma Fire Department recruit firefighters and their instructors participated in search and rescue drills, flammable liquid extinguishment and live fire training drills at the Washington State Fire Academy training grounds in North Bend, WA. The recruits practiced basic and advanced skills needed for a firefighter to function efficiently during interior search and rescue missions using their self contained breathing apparatus. They participated in field exercises utilizing specially designed mockups of automobiles burning at a curbside and other portable flammable liquid props. They learned the behavior of flammable liquids, the procedures required to safely control and extinguish flammable fuel fires and also the environmental concerns that must be addressed. Lastly, the recruits took part in the "Burn to Learn" course which is designed for new firefighters and presents an unusual opportunity to review hose handling basic skills in a demanding fireground scenario. Narrative: At 9:27 p.m. 12 Companies of Tacoma Fire Department and Central Pierce Fire and Rescue responded to a reported apartment fire. Engine 10 was the first company on seen and reported flames coming from the backside of the single story, wood frame apartment building. Fire attack was initiated with a 2 1/2" preconnect hoseline due to the heavy volume of flames. Roof ventilation was completed and the crews rapidly extinguished the fire and prevented it from spreading to the adjoining apartment. 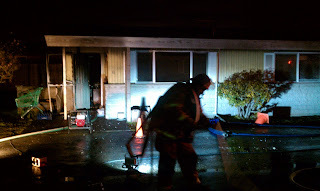 Two occupnats were home at the time of the fire. They both were able to self rescue themselves. Tacoma Fire transported one patient to a local area hospitial.